A few weeks ago, we put out a viz highlighting the richest person on each continent. We thought we would take this one step further to show you the richest person in each country according to Forbes. To further refine our analysis, we required that each person amass a personal fortune of at least $1 billion. We created the maps to have a dark shade representing a country with a billionaire on our list. We included a photo of the individual in question as well as their estimated net worth. We think you might be surprised by the results. First off, Bill Gates is not on our list. Why? Because Jeff Bezos is officially worth more than him. Amazon has made some recent high-profile business decisions, including the acquisition of Whole Foods and announcing a competition for the location of a second headquarters. Bezos’ fortune is specifically tied to the price of Amazon’s stock. He’s been in first place and fallen behind Mr. Gates before, but for now, he remains in the top spot. 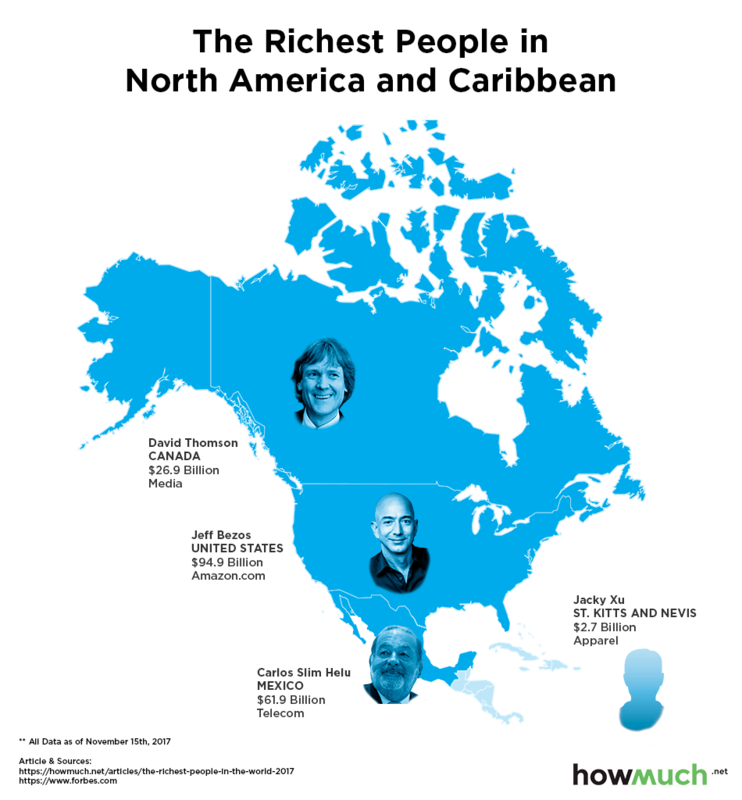 Carlos Slim Helu ($61.9B) and David Thomson ($26.9B) round out the continent, although we should mention the richest billionaire in the Caribbean too: Jacky Xu, who made his money in the apparel industry. 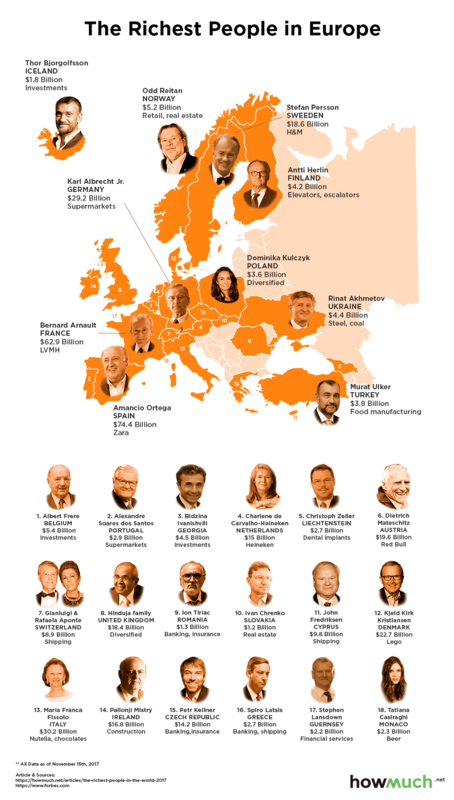 Turning to Europe gives us a more diverse group of billionaires from a wide range of industries. Amancio Ortega from Spain takes the top spot with a fortune of almost $75 billion, followed by Bernard Arnault at just under $63 billion. These two men are in the top the five richest people in the world. We should note that the countries in what used to be Yugoslavia are missing from our list, as are many places in Eastern Europe. These economies still have a long way to go before they produce ultra-rich billionaires. The situation in the Middle East and Asia reflects the industries dominating these local economies. Russia’s richest person, Alexey Mordashov, made his fortune in steel and investments, while the richest tycoon in Kazakhstan, Vladimir Kim, made his money in mining. China’s and Japan’s wealthiest billionaires both made their way through technology companies, and Philip Ng from Singapore made his money through real estate. 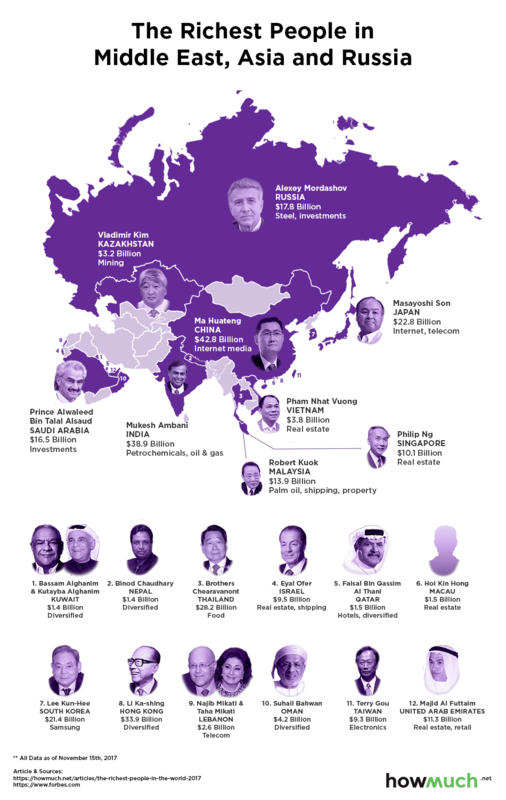 Interestingly, the countries west of China stretching toward Syria don’t have any billionaires on our list. 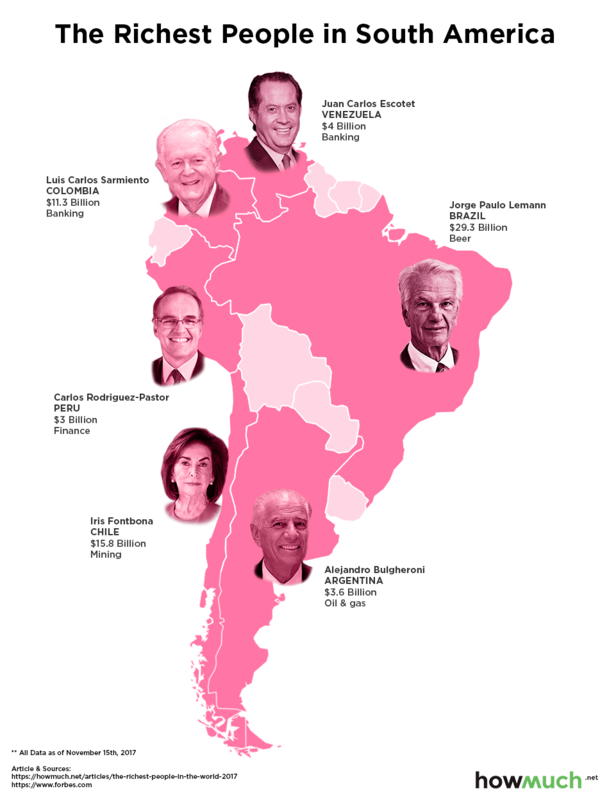 About half the countries in South America are rich enough to produce multi-billionaires, three of whom come from the finance and banking industries. Jorge Paulo Lemann is the richest among the group with a net worth of almost $30 billion. He made his money by investing in breweries, which through a series of mergers and acquisitions became AmBev. The situation in Africa is telling. Only eight people make our list of billionaires, many of whom come from old industries like construction, diamonds and food. Only two people are from the banking and investment industries. Most importantly, look at all the countries with a light shade of green. 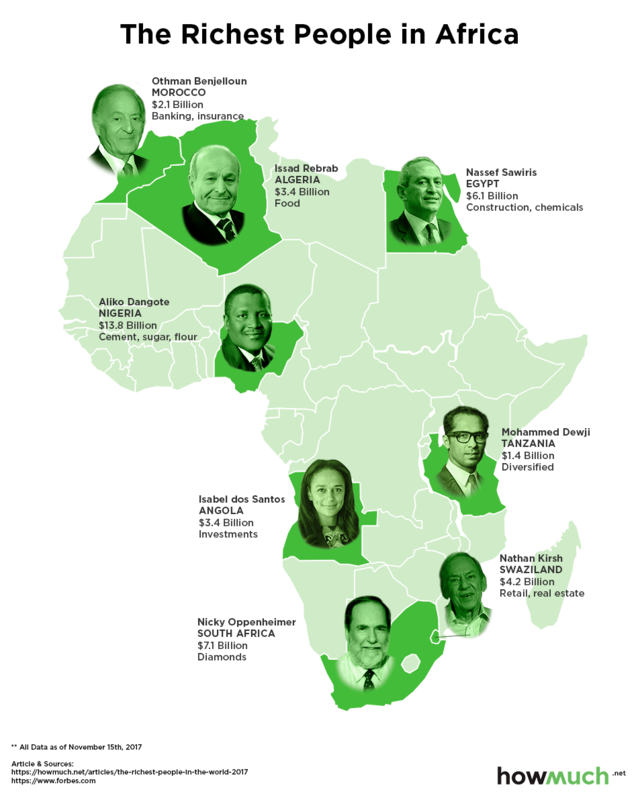 Our map indicates at a quick glance how far Africa needs to go in terms of developing its economies. Oceana contributes four people to our list, and they all have more than $10 billion through a variety of industries. 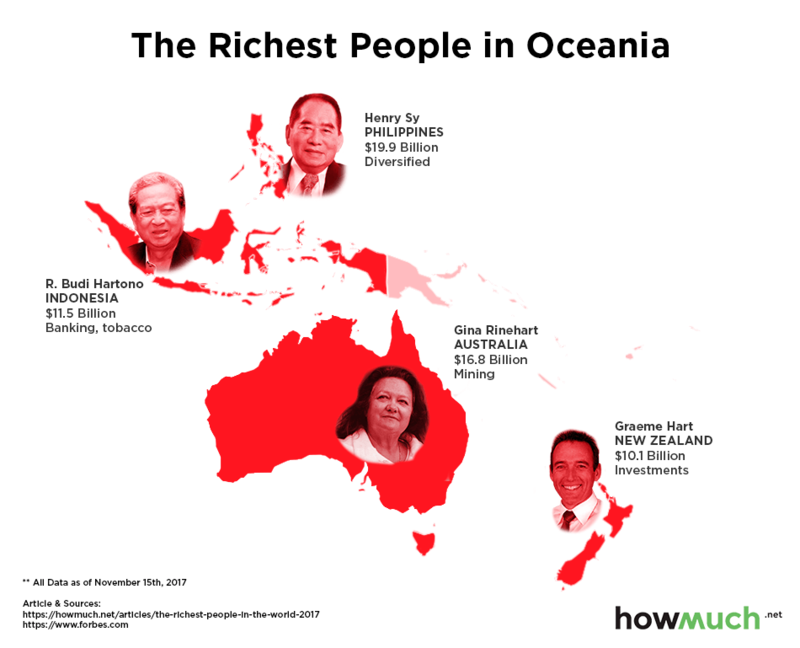 Budi Hartono for instance boasts a fortune of $11.5 billion and has a background in banking and tobacco, and Gina Rinehart ($16.8B) from Australia made her money in mining. Take a look at our list breaking down the ten richest people in the world regardless of where they live, together with their estimated net worth ($ billion), how they made their money, and where they live. Consider this fact. If you add together the fortune of these ten people, you’d have over half a trillion dollars. That’s a ton of money, and the big lesson is that billionaires can come from a variety of different industries. But once again, what’s the missing continent with the furthest to grow? Africa.